"A short ingredient list makes this a weeknight possibility. It works great at potlucks, card parties or big family gatherings. What I love about it is that everyone has an individual serving and service is simple. Toss up a salad and dinner is done! Servings can vary depending on how hungry everyone is. Kids usually eat one and hungry husbands can easily eat two. You be your own family's judge. Rest assured everyone will love these." Spray a large baking dish with cooking spray. Bring a large pot of lightly salted water to a boil. 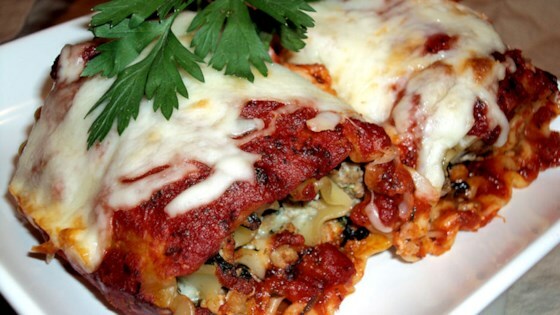 Cook lasagna in the boiling water, stirring occasionally until cooked through but firm to the bite, about 8 minutes. Drain and reserve pasta in a bowl of cold water. Heat olive oil in a large skillet over medium-high heat. Cook and stir turkey, mushrooms, Italian seasoning, salt, and black pepper until turkey is evenly browned. Stir spinach and garlic into turkey mixture until heated through, about 1 minute more; remove from heat and allow to cool slightly. Spread about 1/2 cup marinara sauce on the bottom of the prepared baking dish. Stir 1/2 cup mozzarella cheese, ricotta cheese and parmesan cheese into the turkey mixture until well mixed. Spread about 1/4 cup turkey and cheese mixture down the center of each lasagna noodle, leaving a space about 2 inches long at the end of the noodle. Roll the noodle up from the opposite end and arrange on prepared baking dish seam sides down. Repeat with remaining rolls. Pour remaining marinara sauce over lasagna rolls. Bake in the preheated oven until sauce is bubbly, 30 to 40 minutes. Sprinkle remaining 1 1/2 cups mozzarella cheese over the rolls and return to oven. Continue baking until cheese is melted, about 5 minutes more. Learn how to make delicious, creamy tetrazzini with leftover turkey meat. I like to make these on Sunday when I have a pocket of time and then bake off for dinner on Monday night or pop in the freezer to save for when I am crunched for time. Delicious! I had 1.5 pounds of turkey and I used more ricotta cheese - it came out delicious! I will certainly be making this again! Love it! Turned out great! I used Whole Grain Lasagna noodles, low fat cheese and added 3/4 tsp of cayenne pepper. Made this for meal prep for next weeks (or 2) lunch.